At the start of Petit Mal we find three characters idling in the middle of a dark junkyard, walking on tyres and climbing chains for want of anything better to do, testing the limits of their environment and boredom, starting fights. The music for these opening scenes—the louche, sly, weary voice of the elder Bob Dylan—says it perfectly: seen-it-all, been everywhere, don't much care. It's an attitude of unconcern that's settled into the rough execution of the piece—the fights may not be real, but the impacts and crashes certainly are, and there's a feeling that Petit Mal finds, if not happiness exactly, then satisfaction and exultation in confrontation and failure, collision and risk. 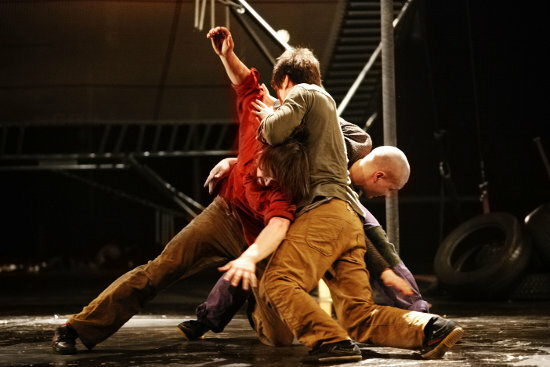 Whether it's one performer heaving a heavy car tyre up to his friend then sanguinely waiting for it to be dropped back on his head, a breakdancer working in the cramped space under a trampoline who collapses every time he tries to stand, or the wild, thrashing descents of Petri Tuominen on pole, it embraces the consequences of action and ignores the safehouses of rest and comfort. You don't want to try any of this at home. Except that maybe you do. But you shouldn't. After seeing the show I learned where the title comes from, and some of the inspiration for the piece, but in watching it I think there's only mood and rhythm and sensation. That doesn't mean either that it's unthinking, or that it's complex but inscrutable: it feels just that the narrative has been stripped away by the same mind that decided two tyres and a plank would do for a teeterboard. If you don't need it, throw it out. It's an approach that holds for at least the first half of the show, and when it comes to beauty and lyricism Petit Mal is incredibly strict and self-aware, always cutting its higher moments short by casual interruption—kicking out the acrobatic ball, turning off the lights mid-routine, or, in one case, literally cutting one of the guy-wires tethering the Chinese pole, sending it lolling backwards as the climber hangs on. In the second half the fierce energy of the performers—previously contained in their drifter personae—is let loose and it can be adolescently indulgent: there's a leafblower which might have been included only to fulfil a lifelong ambition to operate a leafblower; a sudden skit with a mountie and a pantomime horse is funny but feels like street work, out of place against the show's subtler textures; and when the stage is flooded with acrobatic balls for the cast to throw themselves on and over it starts to drift too far toward the spectacle of adults in the pit. But I don't think any of that much matters, and even if there was genuinely nothing else to recommend it you should go to Petit Mal to see Rauli Kosonen on trampoline, an apparatus which he can only have been born for. It's not the tricks really, just the sight of him in the air, relaxed and weightless, running a few steps, kicking out a leg, executing a slow turn—I honestly can't remember the last time I was so excited watching nothing more than one person moving freely in the sphere of their exceptional ability. His final trampoline solo, at the end but not quite the end, provides the climax and prepares the ground for the show's last gesture: in the midst of the destroyed set and scattered feathers and ripped-up floor, one of the sweetest you'll see.